If your entire library is too big for your iPod, you may want to copy individual items manually. By setting your iPod to manually manage music and videos, you can add content to the device directly via iTunes. 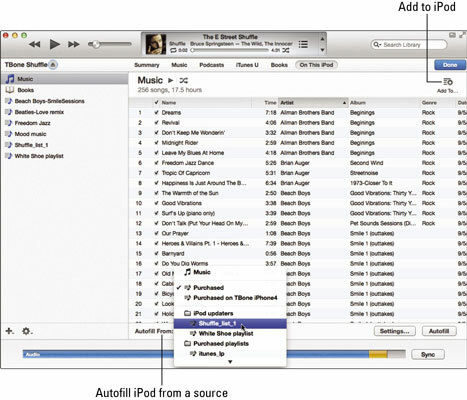 You can even copy some songs or videos from another computer’s iTunes library without deleting any content from your iPod. The Summary sync page appears, displaying sync options. Select the Manually Manage Music and Videos check box (on an iPod shuffle, select Manually Manage Music; if the iPod touch is synced to iTunes Match, select Manually Manage Videos). iTunes displays a message for iPod nano and iPod classic models (and older models), warning you that manually managing music and videos also requires manually ejecting the iPod before each disconnect. Click the OK button for the warning and click the Apply button to apply the change. After setting your iPod to manually manage music and videos, you can automatically fill your iPod without syncing. Autofill either randomly picks songs from your entire iTunes library or picks songs from a playlist you specify. Autofill is especially useful for copying random songs to an iPod shuffle every time you connect it to your computer. Eventually, you can shuffle through everything in your library if you so wish by randomly autofilling your iPod shuffle every time you sync. Click the On This iPod tab. The music on your iPod appears, along with the Autofill From pop-up menu at the bottom. Choose your source of music from the Autofill From pop-up menu. Choose either one of your playlists, or choose Purchased (for all purchased music) or Music for the entire music library. If you choose a playlist, Autofill uses only the playlist as the source to pick random songs. After choosing your source of music, iTunes creates a playlist and displays it. (Optional) Click the Settings button to set options, and then click the OK button. After clicking the Settings button, the Autofill Settings dialog appears. You can choose to replace all the items on the iPod, to choose items randomly, or to choose higher rated items more often. Click the Autofill button to start copying songs. iTunes copies the contents of the Autofill playlist to your iPod. Wait for the copy operation to finish, and then click Done. Always wait until the iTunes status pane tells you that the copying is finished. The music on your iPod appears. Click the Add To button in the upper-right corner of the view under the Done button. Your iTunes library shifts over to the left to make room for the iPod column showing the content types and playlists on the iPod. 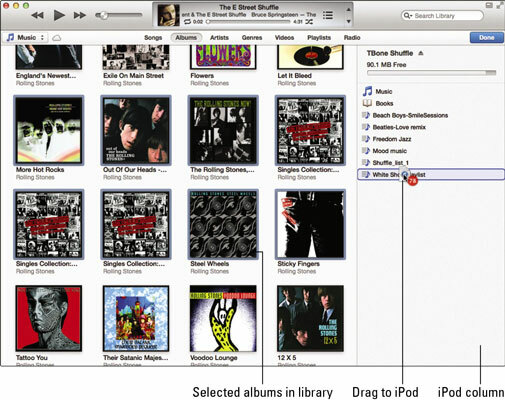 Drag items (such as one or more songs or an album) directly from your iTunes library to the iPod column. You can drag individually selected songs or selected albums — the number of items you are copying appears over the pointer as you drag the items. When you drag an album cover or album title, all the songs in the album are copied. If you drag a playlist name from your library to the iPod column, all the songs associated with the playlist copy along with the playlist itself. You can also copy albums into a playlist on the iPod by dragging them over the playlist name in the iPod column. Wait for the copying to finish and then click Done. Click the eject button and disconnect your iPod from your computer.